An Incredibly interesting phenomenon of Body Language is that it can be applied cross-species. Talk to anyone who owns or has spent time around larger animals and they will give you a myriad of stories. Take for example, the above video clip from the CBS televised coverage of The Belmont Stakes on June 9, 1973. In winning this race, the super horse Secretariat set an all-time, World Record for 1.5 miles for any horse on any track surface (2:24.00). He won by an surreal 31 lengths (ahead of the second place horse, "Twice a Prince). Many of those who were very experienced in the world of sports, including professional athletes, who witnessed this event, will say it was the most impressive performance by any "athlete" in any sport - ever. Many of those who watched, both in-person and on T.V. were also moved to tears. The narrator ("Chic" Anderson) will call your attention to Secretariat's Body movement just prior to him be loaded into the starting gate (at 2:36 - 3:36 in this video) "...moving his head left and right ..... showing that kind of power bursting through the body...". You don't have to have extensive experience with horses to see Secretariat's walk of confidence. He truly has a swagger. 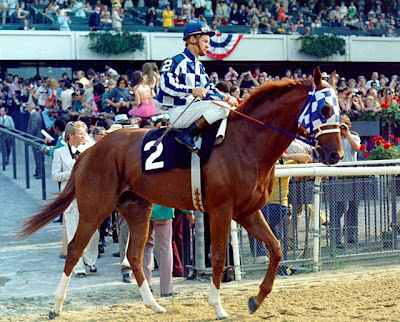 In the second video (ESPN Classic Series), Willam Nack, a sports journalist, author and consultant in Disney's 2010 Film, "Secretariat", described the wonder horse that morning before the Belmont Stakes as (2:50 through 3:09 in this video): "....The fittest I have ever seen a horse. His eyes were big as saucers (eyes opened widely in this context is indicative of an adrenaline surge). His nostrils were flared (which in humans is certainly very expected to see in emotional and physiologic preparation for "flight or fight" - another sign of adrenaline surging). He was nickering (Some interesting human equivalents are the "Kiai" in martial arts - or the "Haka" war chant of the Maori of New Zealand). His ears were Playing (... "ready to bolt"...). His muscles were rippling and he was walking on his hind legs. A bit later in the ESPN video, Nack further describes Secretariat (3:42 - 3:50), "I'm looking at him and I'm thinking, I've never seen him walk like this before - he looks like the execution man. He's going to the gallows. He's about to dispatch somebody." Silvan Tomkins, one of the pioneers of Body Language worked for a horse racing syndicate while in graduate school in the 1930's. Despite the fact that he did this during The Great Depression, he was able to make an impressive income and live "lavishly" on Manhattan's Upper East Side. Tomkins believed that the faces, body language and emotional history of any particular horse in different and specific contexts would be highly predictive of the horse's confidence and potential performance in a race. Tomkins was a genius at Body Language, particularly Facial Expression (Gladwell via Ekman). I wonder what he thought about Secretariat? It is another curious phenomenon regarding animals and body language, that those who are raised around lager animals that require care - most commonly dogs and horses - will end up becoming adults with superior interpersonal communication skills. Most notably, their empathy skills will be highly developed.